Dysprosium doped magnetite (Fe3−xDyxO4 with x = 0.0–0.1) nanoparticles have been synthesized using the co-precipitation method. 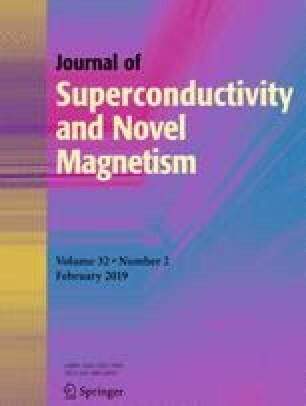 Magnetic characterization using vibrating sample magnetometer (VSM) has revealed an enhancement in the saturation magnetization with Dy3+ doping. The occupancy of the dopant ions in magnetite lattice has been probed using Fourier transform infrared spectroscopy (FTIR). The shifting of ν2 (Fe–O) band at 452 cm− 1 for undoped samples to 443 cm− 1 for dysprosium-doped samples is indicative of occupancy of dysprosium at the octahedral site. X-ray diffraction (XRD) patterns have been used to calculate the strain and lattice constant. The strain is found to increase with doping level and attained a maximum value for the x = 0.03. This increase in the strain can be attributed to occupancy of large diameter Dy3+ ions at the octahedral site of spinel structure of the magnetite lattice. The authors thank USIC, Delhi University for facilitating the FTIR measurements. The authors acknowledge the Indian Institute of Technology, New Delhi for XRD characterization. The authors thank Prof. Annapoorni, Delhi University, Delhi for facilitating the VSM measurements. The TEM characterization was carried out at the Advanced Instrumentation Research Facility, Jawaharlal Nehru University, New Delhi. Authors are thankful to Dr. Gajender Saini for the help rendered in SAED analysis.